Police were searching for a soldier with sniper training who they suspect shot his wife to death while she sang with a band in a restaurant and bar. Robin Munis was shot in the head just after midnight Saturday as she sang with the classic rock and country group Ty and the Twisters. Customers of the Old Chicago ran — to a bathroom, a walk-in refrigerator and anywhere else they could find cover — as a black pickup truck drove slowly out of the parking lot, then sped away. "At first we thought it was just a speaker blowing up or something. I looked over and saw her on the floor," said Travis Brooks, who had been sitting at the bar. Brooks said he was not sure where the gunshot came from when he saw the glass door break. He and others crawled toward the kitchen and took cover in a small bathroom. "Everyone was in shock," he said. "I don't know what to think." Munis, 40, had recently separated from her husband, David Munis, 36. She had complained about receiving a harassing telephone call from her husband Friday, police Capt. Jeff Schulz said. Police suspect Munis was the shooter, Schulz said, though no one has reported seeing the shot fired. "We're not certain where he was when he took the shot," Schulz said. "It could have been in the parking lot. It could have been a long ways away. We don't know that." Munis joined the Wyoming Army National Guard in April 2003 and came from the regular Army, where he went to sniper school, Guard spokeswoman Deidre Forster said. Forster said Munis' job is to promote Camp Guernsey, a military training area about 100 miles (160 kilometers) north of Cheyenne. He is due to become a second lieutenant next month, she said. Munis was filmed discussing his work in 2005 by CBS affiliate KGWN-TV in Cheyenne. 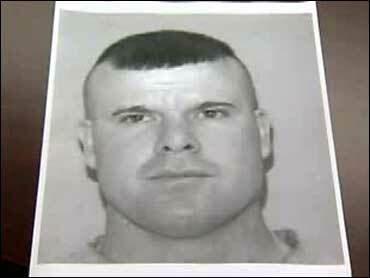 Authorities believe Munis, a big hunter and avid outdoorsman, might have fled into the woods, KGWN-TV reported. Police also said Munis has relative in Montana and a friend at an army bass in Kentucky who they might want to stay in touch with, the CBS affiliate reported. The shooting left members of Cheyenne's music scene stunned and saddened, reported the Wyoming Tribune-Eagle. Friends described Robin Munis as a consummate professional musician, a dedicated mother, and someone who helped people who have disabilities, the paper reported. "Robin was the kindest, warmest and most loving person," Eve Ashley, who plays electric bass with Munis' band, told the Wyoming Tribune-Eagle. "She never dwelt on the negative."